Vibed is a realtime vibrating-string modeler synthesizer, and is one of several instruments included in the LMMS (Linux MultiMedia Studio) DAW available in most linux repositories. Vibed is capable of producing up to nine "strings," each of which is activated by clicking the LED light to the lower right of the waveform window. Each string's waveform can be selected to the right of the GUI window, and mouse-drawn as well. 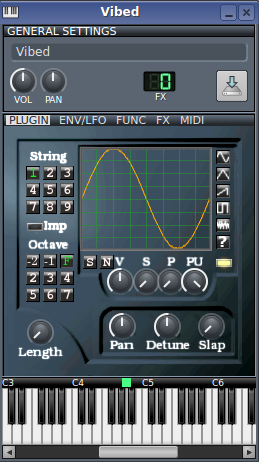 Preset waveforms include sine, triangle, saw, square, noise and user-defined (to add your own wave file). The waveforms can smoothed (S button) and normalized (N button). There are also controls for each wave below the waveform window, including volume (V), string stiffness (S), pick position (P) and pickup position (PU). The IMP button selects whether the given string waveform is an impulse or the initial state. The Octave section allows to select the current string-wave's harmonic setting. The Length knob controls the length of the string; there are also panning, detuning and slap knobs. The Envelope/LFO window is fully-active in Vibed, as is the Function (note stacking and arpeggio), FX and MIDI windows. My first presets for Vibed: Vibed Patches 14 Sept.17 Unzip the compressed file into your ~/lmms/presets/Vibed directory. Refresh the (starred) LMMS presets window. Drag the desired preset unto the instrument track to load it.